The service is launching with one cart servicing a specific 39 block area of Wilmington. Riders can schedule service through the WilminGO App. 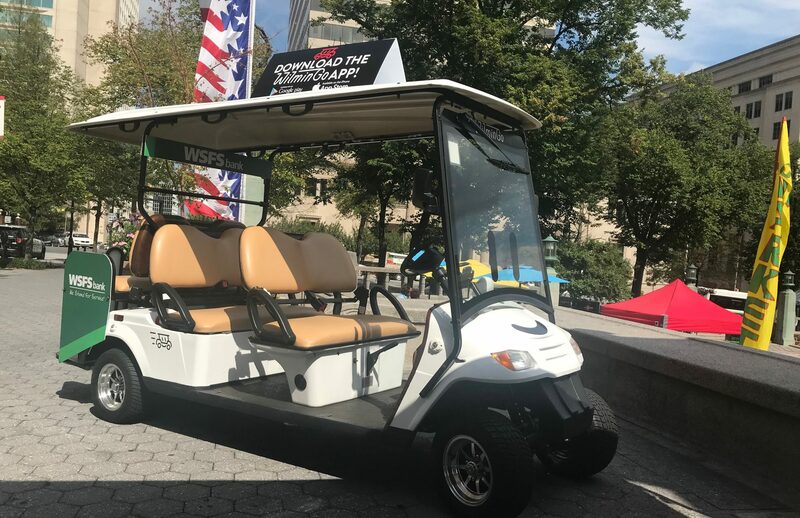 Wilmington, DE – Wilmington and Chevy Chase, MD-based developer The Buccini/Pollin Group, Inc. (BPG) is pleased to announce as of September 19th 2018, WilminGO, a golf cart taxi service launched through the BPG-Horn Fellows program is now accepting riders through their app, downloadable both through iTunes and Google Play. The service has completed their beta testing and will be available between May 1st and October 31st from Monday-Wednesday 11 AM- 3 PM, Thursday-Friday 11 AM- 3 PM, 5 PM- 1 AM, Saturday 1 PM- 1 AM and Sunday 10 AM- 6 PM. The cart can hold up to five passengers, with flat-fee rates of $3 for one or two people, and $5 for more than three passengers. WSFS is the proud first season sponsor of the service, and is delighted to support the entrepreneurial spirit of the business as well as the convenience the cart will bring to the downtown area. Sponsorship opportunities to advertise on the cart will open up with each operating season. For the remainder of 2018, the cart will operate within a select radius of Downtown Wilmington spanning from 2nd and Market to 12th Street. A full coverage map can be seen on WilminGO’s website, at www.wilmingoride.com. In 2019, the WilminGO team looks forward to expanding with additional carts and a larger service area, connecting downtown to the riverfront area. The unique service was inspired by Chris Buccini, Co-Founder of the Buccini/Pollin Group’s visit to Nashville, where golf cart taxi’s are prevalent. Chris had the vision to bring the service to Wilmington, DE and developed a BPG-Horn Summer Fellows Program as a partnership with the University of Delaware. The partnership serves as a bridge between the bright, entrepreneurial energy of the University of Delaware students within Horn Entrepreneurship and The City of Wilmington. Andrew Cercena and Matthew Lombardi were the very first students through the program, with support from the Buccini/Pollin Group, received invaluable experience launching the small business venture. Chris envisions additional dynamic start-ups from this program and has a goal for the students to bring ideas to the table and BPG to financially back the new business ventures which will ultimately serve the individuals of the greater Wilmington area. For more information on WilminGO and directions on downloading the applications to book a ride, visit www.wilmingoride.com.